Customer management giant Salesforce.com Inc. has launched an integrated identity service for its customers, allowing them to connect across apps and devices. Branded as “Salesforce Identity,” the new features act as a good way to get around the bring your own device (BYOD) barrier. With cloud and mobile devices in the workplace, there are a lot of unsupported apps and devices entering an organization’s system, so IT departments have had to set up identity silos to protect their organizations’ data. Salesforce Identity allows an organization’s employees, customers, and partners to connect to any app on any device. By logging in once, employees can then access all of their own apps until they leave the company. At that point, their former supervisors can revoke access to apps, even mobile apps from specific devices. Partners also get a certain level of access to the same app. For CIOs who need to maintain control over their organizations’ networks, Salesforce Identity allows them to access a cloud directory. The cloud directory comes with user profile management, workflows, and delegates administration to ensure employees comply with company policy on BYOD. It also includes directory integration using Salesforce Identity Connect, which allows Salesforce to keep supporting existing directories like Active Directory, and it provides reporting and dashboards that users can easily drag and drop to see patterns across their apps. 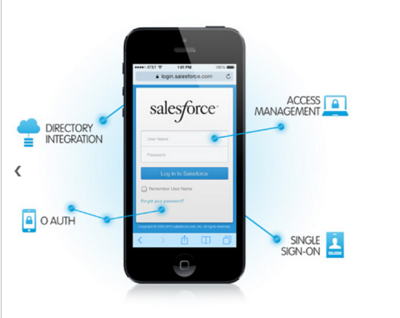 And for end users, Salesforce Identity Connect provides single sign-on for Web, mobile and on-premise apps. It also comes with a mobile identity feature to authorize employees’ mobile devices, as well as policies for mobile devices using Salesforce’s customer relationship management platform. The new feature also integrates with social collaboration, building social feeds from Salesforce Chatter directly into Salesforce Identity, and it allows customers to sign in with Facebook, Google, Amazon, and Paypal. The new feature supports open application programming interfaces, and it is easy to customize it with a Salesforce customer’s own brand, logo, and self-registration. Pricing starts at $5 per user per month for Salesforce Identity, and that includes access to single sign-on, mobile identity, Salesforce Chatter, user and access management, the cloud directory, reporting and dashboards, and social sign-on. However, Salesforce Identity is already bundled with Enterprise and Unlimited Edition licenses for Salesforce Sales Cloud, Salesforce Service Cloud, Salesforce Communities, Force.com, and Chatter Plus.